100 miles further along the trail, and enjoying a very welcome rest day at Big Bear City (mile 265 from the Mexican border). We had been in town for about 5 minutes when a lady recognised us as PCT hikers, and introduced herself as a trail angel – one of an amazing bunch of people who go to great lengths to help out PCT hikers. Her name is Bobbie, and we’re now staying in her and her husband John’s home for 2 nights. She has driven us everywhere we needed to go, fed us, entertained us and mothered us – it’s been lovely! We’ve had a tough stretch of hiking since leaving Idyllwild (mile 160), with the best scenery and most enjoyable walking of the trail so far. 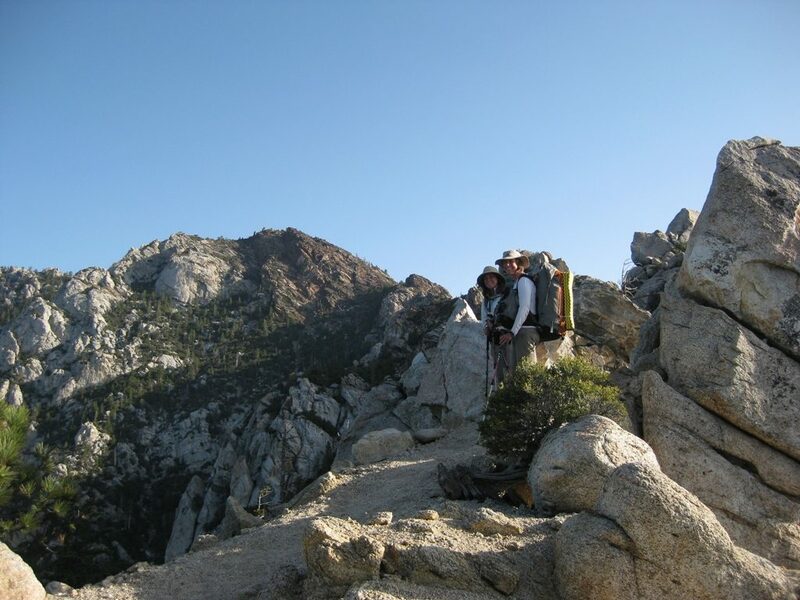 The traverse of the San Jacinto mountains took 3 days and it was hard. We had a long hot ascent, with both of us noticing the effects of altitude as we reached 7300 feet. 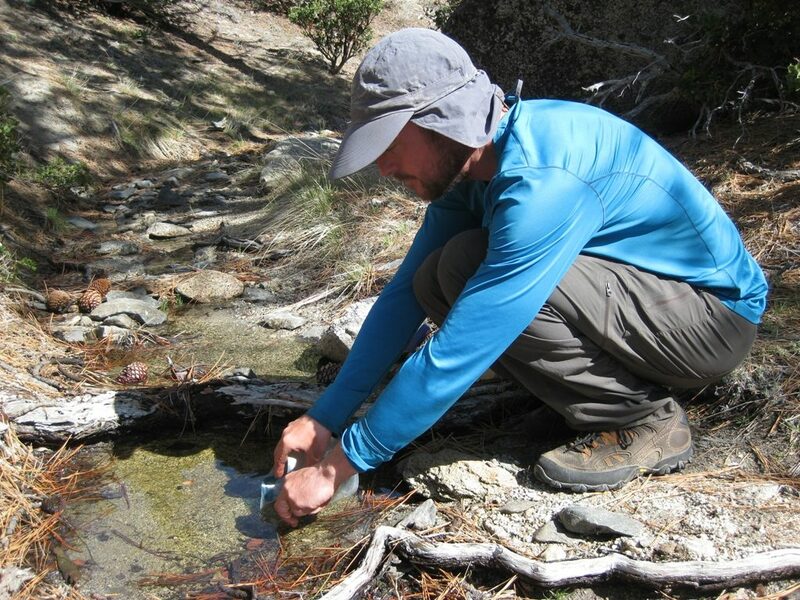 We have a copy of the water report http://www.4jeffrey.net/pct/ which lists springs, caches and other water sources along the way, with updates from hikers on their reliability. Unfortunately the water source we were relying on for this stretch turned out to be a rusty cattle trough filled with yellowy water with worms swimming in it. Foolishly Tanya turned her nose up at it (Neil had more faith in our filters and water treatment tablets!) and we ended up getting horribly thirsty – the next water source being 10 miles further on and about 500 feet below the trail! So the next day, when we got to a good water source, we stocked up with 5 litres of water each, adding 5kg to each of our backpack weights – and then passed lots of flowing springs along the trail. Oh well. 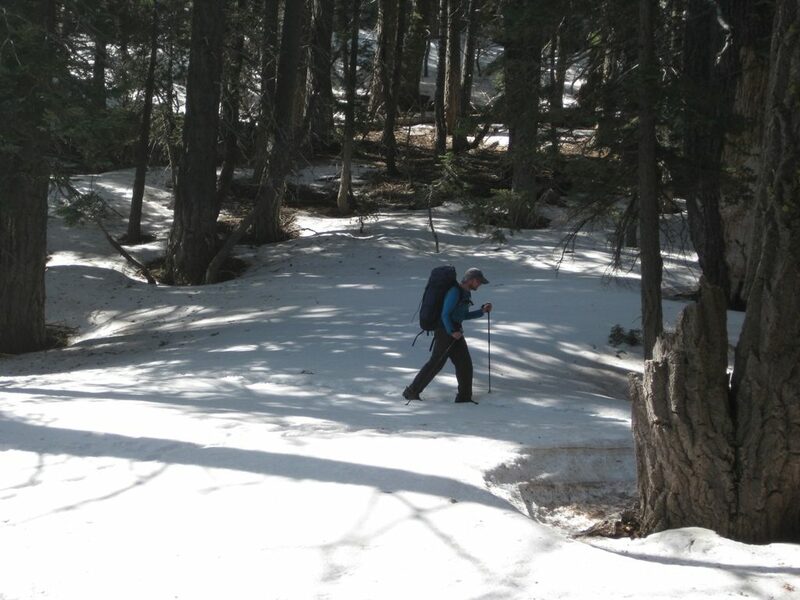 We also had added entertainment along the way from traversing steep patches of snow – we had taken ice axes and crampons just in case, but the only hazard was falling through the snow into voids below (postholing). 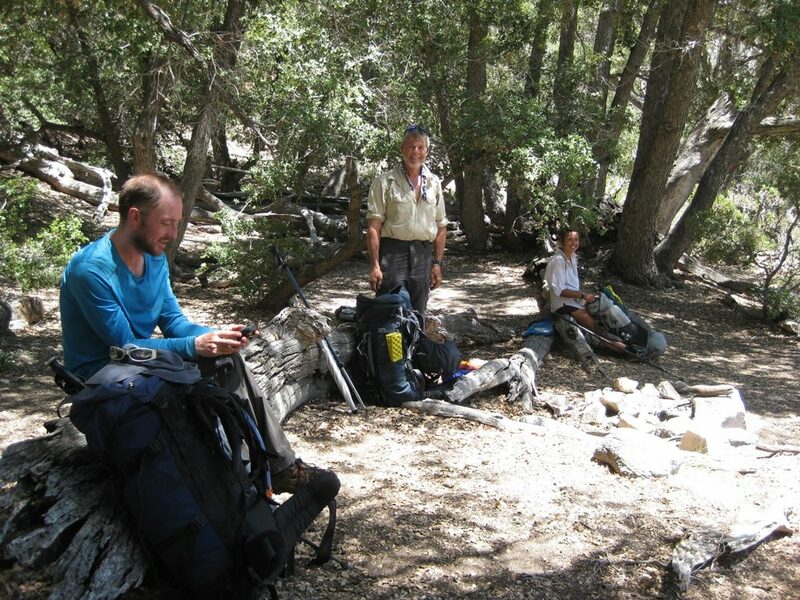 Then we had a long 13 mile descent back down into the desert to the San Gorgonio Pass, another thirsty day where we got our water from a pool in a dry creek bed, and a reedy pool under a rock – now having decided we were thirsty enough not to be fussy! It was a great moment as we walked through the underpass below the interstate highway, and found that the local trail angels, Ziggy and the Bear, had left cool boxes full of cans of pop and bottled beers for thirsty hikers to help themselves! This is known as ‘trail magic’. 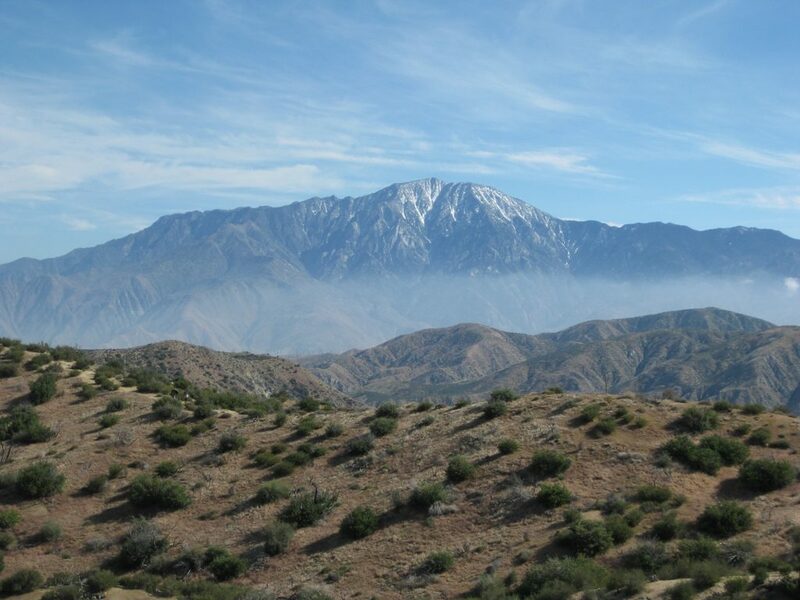 The following day, after staying with Ziggy and the Bear, we headed up into the San Bernardino Wilderness – not as spectacular as San Jacinto, but with some really great walking, and some great company too. There is a bunch of us who walk at about the same pace and keep meeting up at rest breaks and camping spots. There’s Georgia from Portland, Oregon, who is about 5 foot nothing, and has had a bad knee since about day 2, but is tough as anything and just keeps going and going. There’s Rabbit from Florida, who has a pet mouse called Ella with her on the trail, and very much believes in doing things her own way. 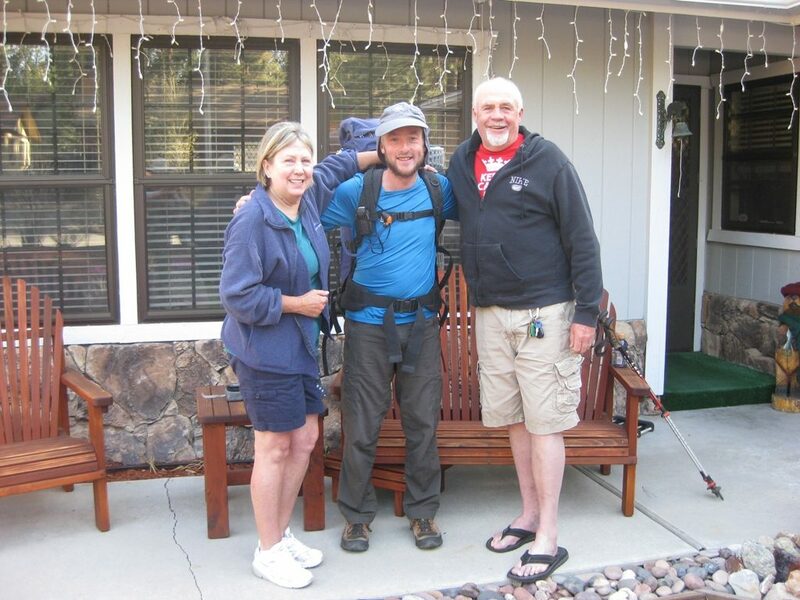 And there’s John, trail name Lone Wolf, and Gail, aka Nightingale, who are calm, steady, experienced hikers who are great company and also full of good helpful information. It was great to go out last night with Rabbit and Lone Wolf for some locally brewed beer at the Big Mountain Brewery – looking forward to getting back onto the trail tomorrow though! Have you not got trail names yet?!?!? !